TAIPEI/TOKYO (Reuters) - Apple Inc will be unable to widely roll out a new version of the iPad Mini with a high-resolution "retina" display this month, people who work in the company's supply chain said, leaving the gadget without the sharper screen found on rival tablets from Google Inc and Amazon.com Inc.
Cupertino, California-based Apple has come under pressure to preserve market share and bolster sales against rivals that are rapidly raising specifications and lowering prices. It remains unclear exactly what new features and modifications could find their way into the next iPad Mini, which the sources said was due to be unveiled this month. But higher-resolution screens and cameras, as well as thinner and lighter dimensions, are among the improvements users have come to expect with updated smartphones and tablets. "If they don't put in retina ... there will be howls," said Frank Gillett, an analyst with Forrester. Apple declined to comment about any product launches and the sources at companies in Apple's supply chain declined to be identified due to the confidentiality of the matter. Apple defines retina display as resolution that is detailed enough that the human eye can't detect pixelation. The feature is available on some full-sized iPads, and similar resolutions are available on iPad Mini competitors such as Google's Nexus 7, as well as Amazon's seven-inch Kindle Fire HDX due to go on sale this month. The reason behind the delays in manufacturing the retina display screens for the iPad Mini were unclear. One source at a supplier said there were delays in Apple's certification of panel producers, which were given strict power-saving requirements. LG Display Co Ltd, Samsung Electronics Co Ltd's display unit and Sharp Corp all vied to manufacture the panels, supply chain sources said. The three display makers declined to comment. Given the time required to ramp up screen production, a retina display-equipped iPad Mini would not be available in large volumes until early next year, the sources said. The sources expected Apple to either wait until early next year for a full-fledged launch of a retina display iPad Mini, or to make a retina version only available in limited quantities before the end of the year. Apple has also told suppliers to reduce costs, two of the sources said, with one person saying the U.S. firm is looking at rolling out an iPad Mini with a smaller 8 gigabytes of memory. Less memory may allow Apple to lower the price of the Mini to boost sales in emerging markets like China where cheaper tablets, many of them running Google's Android operating system, are gaining market share. 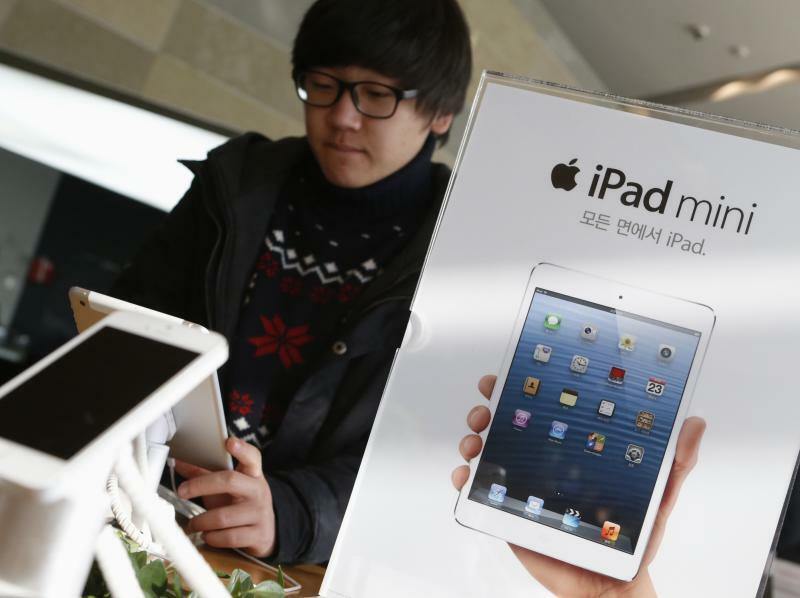 "Right now the iPad Mini is more expensive than everyone else in the 7- to 8-inch tablet segment," said Arthur Liao, an analyst for Fubon Securities in Taipei. "If it could reduce its price by even just $50, it would appeal to more consumers." The iPad's total market share almost halved to 32.5 percent in the second quarter from a year ago, while Android devices, including Samsung's Galaxy series, gained nearly a quarter to 62.6 percent, a survey by tech research company IDC showed. Amazon's new 7-inch Kindle Fire is priced from $229 for 16GB wifi-only models, while Google's second-generation Nexus 7 offers a similar screen size and storage capacity at the same price. By comparison, the cheapest model in Apple's current 7.9-inch iPad Mini lineup with 16GB storage size starts at $329. Anyone expecting Apple to dramatically cut prices is likely to be disappointed, analysts said, pointing to the higher-than-expected price tag for the iPhone 5C unveiled this month. "Don't expect the prices to be significantly lower," said one of the sources. "Even though Apple aims to cut down on component costs, it still ends up around the same as the current Mini because the new Mini will have upgraded specifications."